Big day around here today-it started with everyone making their beds and getting their clothes on before breakfast. 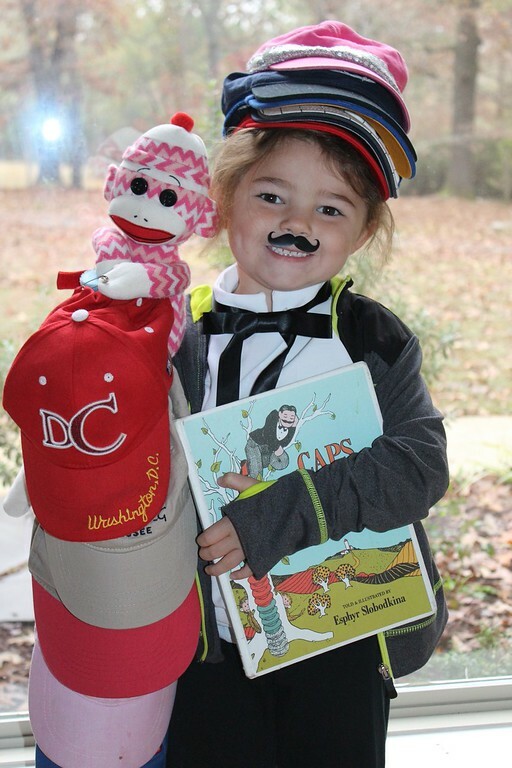 Then it was time to dress Keaton up for her first book character day. She was the man from the books Caps for Sale. She had a stack of hats on her head and then was carrying a pole filled with caps along with a monkey on top. To top it all of she was also wearing a mustache. Seriously, she was the cutest thing ever. The kids sat and did their school work while we waited on the book character parade to start. Then after the parade was over, we came home and started on our school work. I had already prepared myself mentally that we wouldn't finish much of anything today. But I was shocked to learn that we did finish and the boys were even done way before lunch. They had the same amount of work but who knows how they finished it on time. We then had lunch and worked on chores for a bit before going to Grannymom's house. We picked up Keaton and dropped Whitman off. We were headed skating and my crew was pretty excited to go. Today was Keaton's first time to go skating and as soon as I paid, I started receiving skate after skate-size 3, size 1, size 2, size 1 and size 9. The kids sat down and all took off their shoes and then just stared at me. Hmm, two hands and ten skates. Before I had finished, my friends had jumped in and helped laced everyone skates with me-it really does take a village and I am so thankful for my village of friends to help! The kids all did well skating-some much better than others. No one is really good yet but they are all getting there-just takes practice. It is good that their friends are there so they can follow them around and improve their skills. After skating, we picked up Whitman and also picked up dessert from my bunko-Grannymom had made apple dumplings for me tonight. Robby was home once we arrived and he had things ready to go here at the house. When he had finished helping me get things ready, the kids and he left for a big night out. The first stop was Tacos 4 Life in Conway and then on to Andys for frozen custard followed by Krispy Kreme for their second dessert. It was a pretty good evening for them! When they came home they all had showers and then went to bed. I guess everyone was able to sleep fine despite all of the racket coming from a house full of bunko girls laughing!